Narrator: In between the years when the oceans drank Atlantis and the rise of the Sons of Aryas, there was an age undreamed of, when shining kingdoms lay spread across the world. Then, came the dark empire of Acheron, where cruel Necromacers sought 'Secrets Of Resurrection'. They crafted a mask from the bones of kings, and awakened it's wrath with the pure blood of their daughters. The mask summoned spirits of unspeakable evil, giving them power that no mortal man should posses. 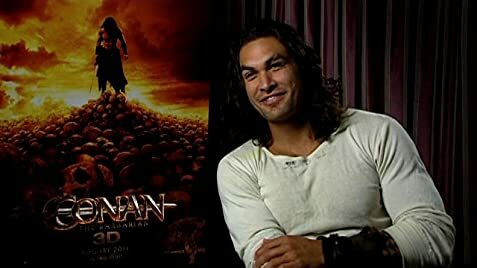 Q: Wasn't a third Conan movie made? Q: What are the differences between this and the Schwarzenegger movies? Q: Is this a remake of the Milius/Schwarzenegger movie? I've always been a fan not only of Robert E. Howard's fantasy stories but also of the Marvel Comics or the 1982 film "Conan the Barbarian" with Arnold Schwarzenegger. So when I heard of a new Conan I was most interested. With today's budget and cgi they really could pull it off. Oh Man I was wrong. Words cannot adequately describe how terrible this movie is. It's that bad. However I have come to my senses to provide you with seven reasons why this film is bad. Number 2, the script is bad and as soon as Conan's Mother opens her mouth to name his son before she dies we know we are in for a treat of bad dialogs and overall silly script. What follows is ridicule one liners deliver with zero conviction from every protagonist. Number 3, where are the sidekicks? In a Conan film good sidekicks are mandatory. I remember Subotai (Jerry Lopez) in the 1982 Conan. He was a cool, loyal, and courageous dude. Every fan of this film remembers the crucifixion scene when suddenly Subotai appears in the horizon to save the day. Valeria was also a very likable and an equally strong character, some sort of Valkyrie that impacted Conan's emotions. In this 2011 version female characters are filler. The dialog of the main female character consists in screaming "Conan" every time she is in danger. Moreover there are no charismatic sidekicks or even interesting other characters. The black pirate serves as a pretext for a black character but has the personality of a "playmobil"; the "Arabic" Thief is so common I don't even remember his name or face. Stephen Lang as Khalar Zym does not do the job. Sure there wasn't much to do with the poor script he had in hands and screaming "barbarian!!!" every 2 seconds of his screen time doesn't help. Plus Rose McGowan transformed by either plastic-surgery or bad cgi (couldn't really tell) as his witchy daughter Marique is so outrageously goth that you constantly wonder if you are in a Conan film or in a remake of the Crow. 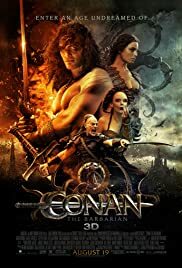 Net net all protagonists are badly written and played even Ron Perlman, as Conan's father, is wasted. We see the girl go mating with Conan in a rocky cave of what seems to be a cliff environment. In the next morning when she attempts to go back to the Ship she gets kidnapped in what appears to be a Forest. At this stage I kept wondering if the Director was a little bit "special" or if the film editor endured a lobotomy half way during the editing session. Now that I think about it it's probably both. they should have. Costumes, armors, or even Architecture (by the way you can clearly see the use of models) don't fit the Conan universe and there isn't any vision or unity regarding the design of the film. As a result you don't have a feel that the story takes place in a possible ancient time with tangible ancient civilizations. So basically the production recycled costumes from the last 10 sand & sandals films and the result is catastrophic. this is a premiere to me. 86 of 130 people found this review helpful. Was this review helpful to you?